Water companies collect sewage from your homes and get it to treatment works via many kilometres of sewer pipes. The sewage is then treated before being put back into the environment. What happens at the treatment works? There are six crucial steps that take place to collect and treat sewage before it can be put back into the environment. 1. 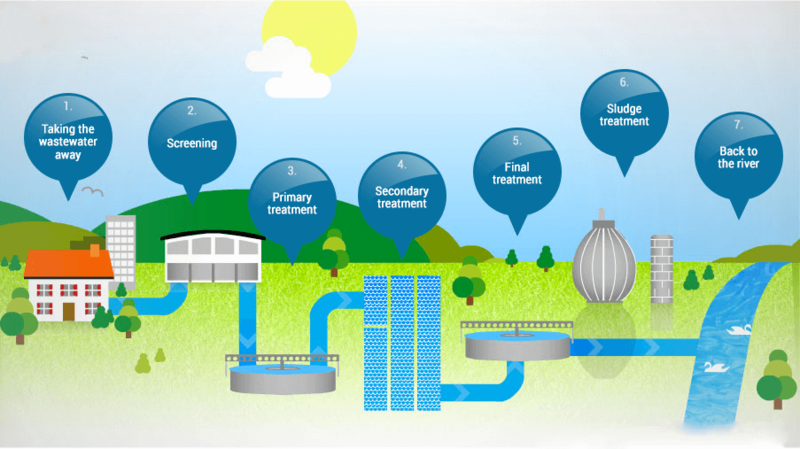 How is wastewater collected and where does it go? As well as getting clean and reliable water to you, companies take it away once you have used it. When you flush the toilet or empty the sink, the wastewater goes down the drain and into a pipe which takes it to a larger sewer pipe under the road. The sewer then joins a network of other sewers and takes the wastewater to a sewage treatment works - sometimes it needs to be pumped there. If you live in a rural area, you may have your own septic tank or equivalent rather than a connection to a sewer. In this case you will need to arrange for a company to empty your tank on a regular basis and take it to the local sewage works for processing. At the sewage works, wastewater passes through four treatment stages before being safely returned into rivers. 2. Want to know more about the screening process? The first stage of cleaning the wastewater is to remove large objects that may block or damage equipment, or be unsightly if allowed back into the river. This includes items that should never have been put down the drain in the first place - such as nappies, face wipes, sanitary items and cotton buds - but often can be things like bricks, bottles and rags! The wastewater often contains a lot of grit that gets washed into the sewer, so companies have special equipment to remove this as well. 3. What happens during the primary treatment process? The wastewater still contains organic solid matter, namely human waste. The next stage is to separate this from the water, and to do this, companies put the wastewater into large settlement tanks, which causes the solids to sink to the bottom of the tank. This is called settled solids or sludge. In a circular tank, large arms or scrapers, slowly move around the tank and push the sludge towards the centre where it is then pumped away for further treatment. The water passes over a wall near the top of the tank and is taken to the next stage of the treatment process. 4. What occurs in secondary treatment process? Although the visible bits of sludge have been removed, companies have to ensure that the smaller and sometimes invisible nasty bugs are also taken out. At larger sewage treatment works, the wastewater is put into rectangular tanks called aeration lanes, where air is pumped into the wastewater. This encourages the good bacteria to break down the nasty bugs by eating them. The more they eat, the more they grow and multiply until all the nasty bugs have gone. 5. What is the purpose of the final treatment process? The treated wastewater is passed through a final settlement tank, where the good bacteria sink to the bottom. This forms more sludge - some of it is recycled back to the ‘secondary treatment’ stage, and the rest goes to sludge treatment. The now clean water passes over a wall near the top of the tank. Sometimes additional treatment is needed if the river that the treated wastewater will be returned to is particularly sensitive. The treated wastewater is slowly filtered through a bed of sand, which acts as a filter and catches any remaining particles. 6. What happens to the sludge that is removed from the waste water? Combined heat and power: this process treats the sludge using a process called anaerobic digestion. This is where the sludge is heated to encourage the bacteria to eat it. This creates biogas that is then burnt to create heat, which in turn creates electricity. Gas to grid: companies can also clean the biogas to a higher standard (known as biomethane) so that they can put it into the national gas grid to power homes, businesses and schools. Thermal destruction: this process involves drying the sludge into blocks called cake, which are then burned to generate heat. The heat can be captured and turned it into electricity. 7. What happens to the remaining water that has been separated from the sludge? Once the wastewater is clean, it can be returned to local rivers and streams, or discharged to sea. In some areas, the water put back into the environment can improve water quality in rivers and streams, helping to keep them healthy.